With 25 Years of experience in carpet and upholstery cleaning we at K & S cleaning service know how to get the best from your caravan upholstery. Rather than use off the shelf cleaners why not try our extraction cleaning that injects and removes the soil from cushion, carpets and curtains. This system is great for those who suffer from mite allergies as it removes dust etc from the upholstery etc. 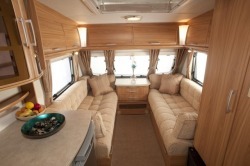 Our pure water system that we use for window cleaning is a real bonus for caravan cleaning. After we have use the detergents to loosen the dirt, algae etc; we then rinse off with the pure water system. this ensures that there no soapy residue causing a sticky surface to attract the dirt helping your van to stay cleaner longer. All detergants we use are freindly to you and the enviroment.